In churches around the world this Easter, we Christians will be remembering Jesus’ sacrifice for us on the cross. We will sing praise, and have our moments of silence for remembrance. We will be thankful for forgiveness for the guilt of sins. We pay lip service to the cross being forgiveness for shame, but that is a confusion of words. Shame is not something that is forgiven, nor can it be. Many in churches suffer silently with their shame, wondering why prayers for forgiveness are not enough. Why they don’t feel forgiven. Shame is not met by forgiveness, guilt is. Guilt is not shame. Guilt comes from knowledge of having done something wrong; of having broken a law or agreement of some kind. Shame is a felt-sense of personal wrongness. It is a self-assessment that values yourself as worthless, flawed, broken, or dirty. You can’t forgive away brokenness or stains. The remedy is altogether different. When Jesus climbed onto the cross and willingly lay down His life for each one of us, He did not do so merely to forgive our sins. No, He did so because He viewed us as worth dying for when we viewed ourselves as worthless. He climbed on that cross and took the shame of all of our sins upon Him unto death. Shame goes hand in hand with death. The felt experience of it is like that of dying. The pain of it, the numbness of it, the experience of shame is deathly. To live in shame is to live as one who is dead. It’s no coincidence then that a sinful life is one that the bible refers to as being spiritually dead. Jesus died to bring us life. Shame normally comes socially. It serves it’s purpose in small doses. It is not entirely bad, but it needs its remedy to be healthy. The experience of shame comes when an observer calls you out for something wrong. Think of a toddler about to stick its finger in an electrical socket. The shout of fright and the stern look from its parent brings on a jolt of shame that shuts down the toddler from afar. Think of the way a young child’s shoulders droop and neck collapses loosely when being shamed. This shutting down stops wrong actions, and brings on a state that allows the child to think on its actions and form new decisions after. If the child is left in shame for too long, however, they can grow either insensitive or overly sensitive to the experience. Neither outcome is healthy or appropriate. The remedy to shame, my friends, is redemption. Religious or secular, the word remains the same. Why? What does redemption mean? You’ve probably heard the old expression, “deemed worthy”. It’s a way of placing value on something. 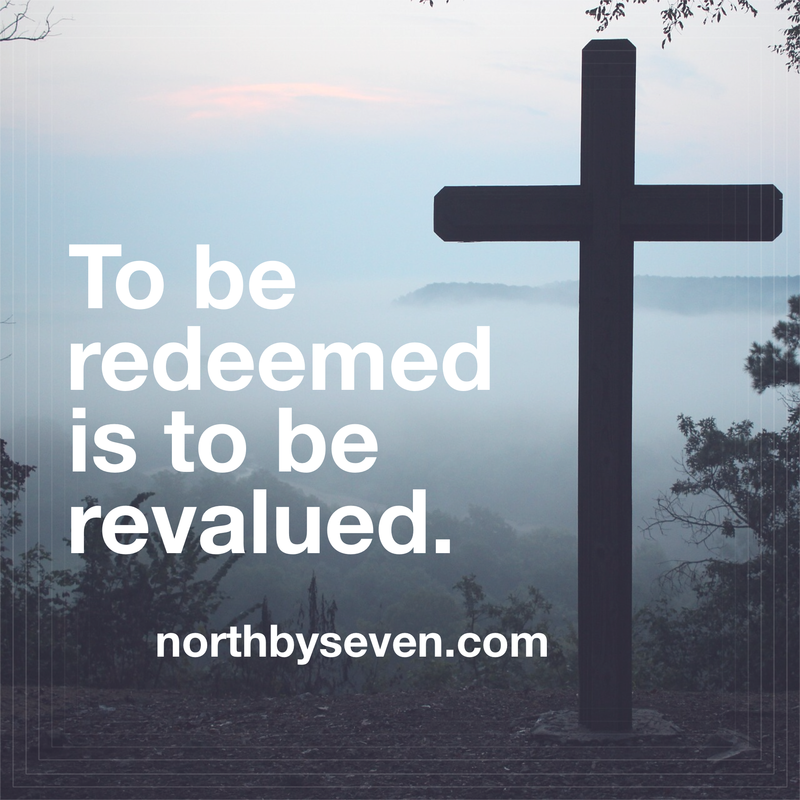 To be redeemed then is to be re-valued. When Jesus climbed onto the cross to die for us because He viewed it as a worthy sacrifice, He did so to bring a new value to us; to you. Whatever value we feel has been lost to the deathly shame of sin, Jesus offers to restore and magnify in us with His sacrifice. Whatever someone else has said of your value, be it a parent, friend, or lover, Jesus has seen value in you worth dying for. … Which is exactly why Jesus died for us. In doing so, He offers us His worthiness to take and put on like a clean robe to cover our nakedness. His blood washes away our dirtiness. His wounds heal our brokenness. His death brings us life. In facing the reality of His sacrifice and in choosing to receive His grace (undeserving favor), we can boldly face the ugliness of our personal reality honestly. It no longer condemns in the perspective of eternity. There is no running away from shame. There is only enduring. You do not run away from death successfully. You go through it like Jesus did, and with Him you overcome into new life. This is the best news I’ve ever heard. This is the good news of Easter. Pass it on.